For engaged couples, a premarital agreement can provide both a level of protection and of security. In addition to specifying how property and assets will be divided in the event the marriage ends, it allows for a full disclosure regarding both party’s finances and spending habits while addressing important estate planning issues. The agreement goes into effect on the date you are married and remains in force throughout your time together. However, it is a good idea to periodically review your prenup, so that you can make any changes that may be required. 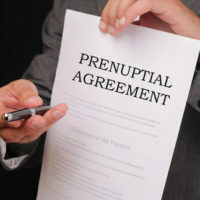 A prenuptial agreement acts as a legal contract between couples planning to get married. Under Section 61.079 of the Florida Statutes, it pertains to the duties, rights, and responsibilities regarding the purchase, sale, transfer, exchange, management, and control of any property or assets accumulated during the marriage. Once you agree to a prenuptial agreement, it is legally binding. In general, there are only limited circumstances in which it can be overruled, such as in cases where one partner attempted to defraud the other or coerced them into signing it. If your spouse engages in marital misconduct. When a spouse engages in adultery, gambling, or suffers from an alcohol or drug addiction, it can drain your finances. It could also entitle you to a greater settlement in any resulting divorce. If your spouse has engaged in marital misconduct, you may want to include a provision in your prenup that it is invalid if the behavior happens again. If you waived your rights to alimony. While you can not waive your rights regarding child custody or child support in a prenuptial agreement, you can relinquish your rights regarding alimony. If you end up sacrificing your own career or education for the sake of the marriage, you may want to change this. If your financial picture has significantly changed. If either you or your spouse comes into significantly greater amounts of property or assets during your marriage, your prenup should reflect this as well. This may include dramatic increases in income or sudden windfalls, such as an inheritance. If you started your own business. If you began a new business once you got married, your spouse may be entitled to a share in the event you eventually divorce. This could put you in the awkward position of either having to take out a loan or possibly sell the business to buy them out. For answers to your questions about prenuptial agreements and whether changes are needed, request a consultation with Fort Lauderdale prenuptial agreement attorney Vanessa L. Prieto. She provides the trusted legal guidance you need in these situations. Call or contact our Fort Lauderdale office online today.